“Inbreeding the Anthropophagi”, the second and last record Deeds Of Flesh released through Spanish label Repulse Records, had the band adopting its known dense, atonal and percussive death metal style – even though they lost co-founder Joey Heaslet prior to the session. It is lyrically more mature than “Trading Pieces” by including a wider variety of gruesome subject matter, not all dedicated to infamous serial murderers of our time. 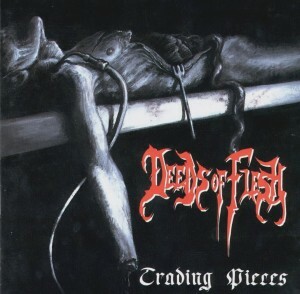 It is the only Deeds Of Flesh record to feature the percussive talent of Brad Palmer, who briefly replaced Joey Heaslet in between the first and third album. While Deeds Of Flesh plays a much faster, and technically proficient death metal variant its lineage in classic acts as Cannibal Corpse, and Suffocation is still clearly audible – even though they put a greater focus on being percussive than writing memorable songs. It’s mostly thanks to Brad Palmer that Deeds Of Flesh retains much of its old school sensibilities. While his work behind the kit is as unforgiving as original skinsman Joey Haeslet’s, likewise he puts in numerous nuances and little details in his fills, footwork and cymbal crashes that his successor never seemed to pick up upon. Much like the debut the dual vocals of rhythm guitarist Erik Lindmark and bass guitarist Jacoby Kingston work in perfect unison, alternating beautifully between growls and shrieks. ‘End Of All’ is an effective opener in the sense that it sets the mood for the album more than it is an actual song. Wholly underdeveloped as a song it is a strong opener, mostly thanks to the Alan Watts quote at its conclusion. ‘Feeding Time’ and ‘Inbreeding the Anthropophagi’ are about the semi-mythical cave-dwelling Sawney Bean clan from Scotland, who were responsible for the execution and cannibalization of over 1000 people. Returning to its old stomping ground ‘Infecting with with Falsehood’ is about H.H. Holmes, the first American serial killer, famous for his hotel that served as an elaborate murder castle. ‘Ritual Of Battle’ on the other hand is about the Cobeus, a South American cannibal tribe located around the Vaupés (Uaupés) river, who eat those that they kill in battle, and even specifically wage war with opposing tribes as a way of procuring human flesh for food. Cognizant of the strength of its earliest material the record includes a re-recorded version of ‘Gradually Melted’. “Inbreeding the Anthropophagi” has the distinction of being the only Deeds Of Flesh album to feature drummer Brad Palmer, who did a commendable job replicating Joey Heaslet’s style. After his tenure with Deeds Of Flesh, Palmer would record drums for the 1999 “Undead Infantry” album from fellow Californian death metal band Scythe, who are one of five acts with that name in North America. Upon completion of the sessions Palmer seems to have vanished in the anonymity of civilian life, and it is presently unclear whether he still has an involvement in the music industry. Deeds Of Flesh would persevere with the style for one more album after which they opted for more linearity. The trio’s consistency with its style is admirable, but given its narrow view of the genre it also severely limited what they were able to do within the framework they set up for themselves. 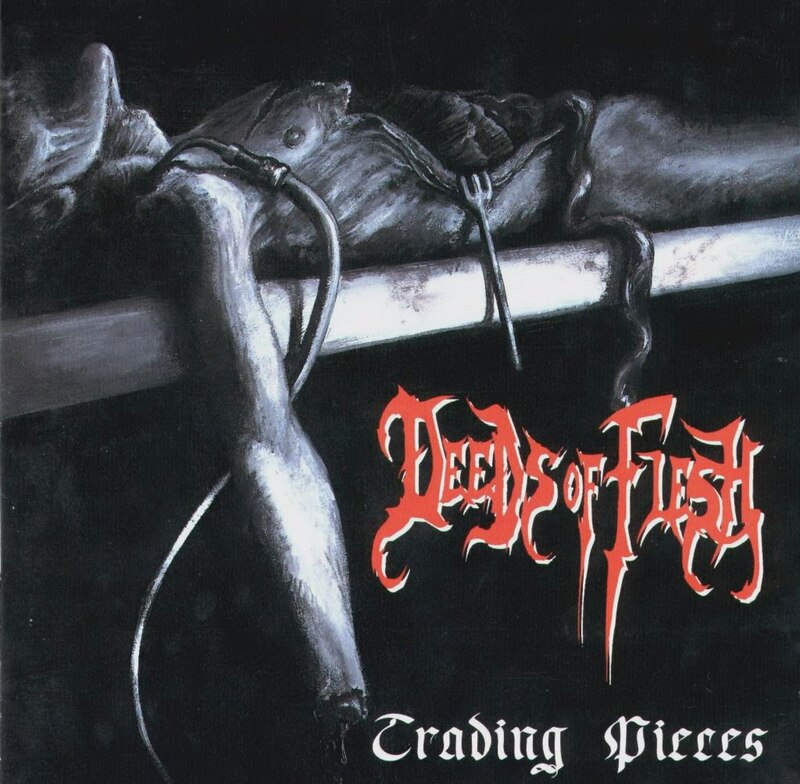 “Trading Pieces” was a less interesting because it went for a more generic style of blast death metal than what is presented on this album, and the next. “Inbreeding the Anthropophagi” and its successor draw far greater influence from the “Gradually Melted” demo session than anything after. It is then not very surprising that the record is concluded with a refurbished version of the demo’s title track. Once again the trio tracked the record at Moon Productions in Arroyo Grande, California with Thomas E. Gingell producing. The production is fittingly bass-heavy with a crunchy guitar tone, and thick guitar bass licks that ooze between the guitar riffs. The drums possess a lot more body with an organic treatment that preserves warm tones for the snares, toms and cymbals along with truly thundering kickdrums. For the first time Austin, Texas-based tattoo artist Jon Zig, rendered the artwork and the canvas used wasn’t one of his better works. In fact the work he commissioned for Disgorge, and Averse Sefira was much better than what is present here. On the visual side the album is beset by problems. The booklet is nearly unreadable due to the conflicting color scheme of the typesetting and background artwork. Purely from a visual standpoint the preceding “Trading Pieces” was superior to this album in almost every way. “Inbreeding the Anthropophagi” was the last of the two records to be released through Spanish label imprint Repulse Records, the label from Avulsed frontman David Sánchez González (Dave Rotten). It was licensed in South America to Sylphorium Records and American Line Productions, who released it in tape format. Additionally Novum Vox Mortis released it on tape format in 1998 as a package with the preceding album “Trading Pieces”. The termination of contract with Repulse Records would lead the trio to start its own label imprint Unique Leader Records, which for the next ten years would release local and international death metal acts to varying levels of success. As it stands “Inbreeding the Anthropophagi” was the defining moment, and signature record, of the band’s career. Its lengthy shadow would be cast over everything the band would do later. As far as percussive contemporary death metal goes, this is one of the best. “Trading Pieces”, the first proper Deeds Of Flesh record, is different from its later output in that it draws from more traditional sources. It is a loosely conceptual record about cannibalism, and serial murder in contemporary society. It is the second of three records featuring original Deeds Of Flesh co-founder/drummer Joey Heaslet. “Trading Pieces” was one of two records to be released through Spanish label Repulse Records. Deeds Of Flesh adopted an even more dense, atonal and percussive death metal style afterwards. What made Deeds Of Flesh so different from most death metal of the time was the sheer propulsion and intensity of its compositions. While “Trading Pieces” is more conventionally death metal in terms of sound, it still is far faster and atonal than what was standard at the time. The dual vocal approach was hardly novel, Tampa veterans Deicide had popularized it many years before, but the interaction between rhythm guitarist Erik Lindmark and bass guitarist Jacoby Kingston did it better than many. The trio’s fixation on speed and percussive intensity comes at the price of dynamic range. In truth “Trading Pieces” suffers significantly lesser in this regard than the band’s later output. This can be attributed to a greater presence of slow parts within each song. Likewise will guitarist Lindmark occasionally integrate a creepy melody or foreboding chord progression, which is something the band would abandon after its debut. Much of the record aims to shock the listener with its content. Not only has gore been a staple of the genre for many years, a lot of times these end up on the comical end of the spectrum. Deeds Of Flesh sidestep this rake in that most of the record deals with cannibalism, and serial murder in one form or the other. Its most interesting tracks are those that detail the work of real-life serial murderers. ‘Carnivorous Ways’ is about serial killer Albert Fish. ‘Born Then Torn Apart’ is a song about infanticide. ‘Chunks In the Shower’ is about German serial killer Joachim Kroll. Alternatively ‘Erected On Stakes’ details East-European antiquity. The song is about Wallachian warlord Vlad Tepes, a Romanian folk hero who became part of popular culture through Bram Stoker’s 1897 novel Dracula that took its name from Vlad’s patronymic. ‘Acid Troops’ deals with MK-Ultra, a classified CIA project wherein troops were given LSD during the Vietnam war. Additionally ‘Acid Troops’ opens with a sample of screaming, artillery and war noise. For the most part “Trading Pieces” is memorable because it isn’t quite as over-the-top as the rest of the band’s discography. As one of the early Deeds Of Flesh works it is more famous for what it set up rather than for what it actually did. Given that the that trio had only been working together for a brief amount of time it is far more loose, and not nearly as frantic and technically demanding as it successors. Heaslet’s drumming isn’t quite as over-the-top yet as it would be on future albums, and some of the tracks here have recognizable hooks – which is something that Deeds Of Flesh would abandon past this album. The characteristic bass breaks here first surface on ‘Impious Offerings’ and ‘Acid Troops’. These very same tracks are also the only two to pass the three-minute mark. The record is bookended by samples of a person getting stabbed, slashed and devoured (although these effects sound more like a person repeatedly walking through muddy patches of water). The samples are supposedly meant to invoke shock in the listener, but end up sounding pretty silly in retrospect. The album was recorded in just three days at Moon Productions in Arroyo Grande, California with Thomas E. Gingell producing. Given the brevity of the session it is surprising that the record ends up sounding as good as it did. The production is adequate for the most part but misses the typical concrete bass-heaviness that comes with a more extensive and properly budgeted session. The guitar tone is actually quite crunchy given its overall thinness, but it is complemented by the thick, throbbing bass guitar. The drums sound functional, but miss the full sound and body of this record’s two successors. The snares and toms sound flat while the kickdrums are very commanding and provide much of the bottom-end heaviness along with the bass guitar. “Trading Pieces” was one of the two records to be released through Spanish label imprint Repulse Records, the label from Avulsed frontman David Sánchez González (Dave Rotten). The artwork by Jackie is fittingly macabre and horrifying, but is not visually interesting enough besides its apt approximation of a classic Cannibal Corpse, or Carcass canvas. It goes without saying that Deeds Of Flesh’s debut album is hardly a mandatory purchase, and in retrospect its only contribution, and importance, to the scene is that it helped usher in a new era for the genre. The band’s defining moment would only arrive with this album’s successor “Inbreeding the Anthropophagi”.